Star of the US The Office John Krasinski has previously dipped his toe into directing with two little-known films Brief Interviews with Hideous Men and The Hollars. A Quiet Place marks his breakthrough as he skillfully exploits a wonderfully simple premise to maximum nail-biting effect. We’re introduced to the Abbott family as they quietly roam an abandoned store. As they tentatively pick up essential supplies we quickly discover that silence is the name of the game. A life-preserving requirement that’s underlined when horrified dad Lee (Krasinski) confiscates a toy rocket from his youngest son Beau (Cade Woodward) and proceeds to remove the batteries as if disarming a ticking time bomb. Once their barren world is established, disaster strikes and the movie’s monster unveiled. Similar to the crawlers in Neil Marshall’s The Descent, the predators are blind and hunt using their acute hearing. A number of days later and daily routines are in full swing. Mum Evelyn (Emily Blunt) delicately prepares food and instigates a muted grace. while siblings Regan (Millicent Simmonds) and Marcus (Noah Jupe) play a hushed game of Monopoly, with its sturdy counters replaced with softer bits and pieces. As daughter Regan is deaf, the family are already accustomed to communicating in sign language. As a result of this, dialogue is completely absent for a large chunk of the film. An impressive prolonged period of silence that rendered me hesitant to take a deep breath and highly aware of my own movements. With the obvious dangers of a hearing impairment in this particular climate, Lee repeatedly plugs away, to no avail, constructing various hearing aids from found fragments. All the while analysing newspapers and notes in an attempt to discover the creature’s vulnerability. Unaware that its weakness lies painfully close to home. Every time I thought the plot was going to trip over itself, the film manoeuvred around potential flaws, especially as it doesn’t overstay its welcome with a snug running time of ninety minutes. While cheap or excessive jump scares often dent the enthusiasm of avid horror fans. 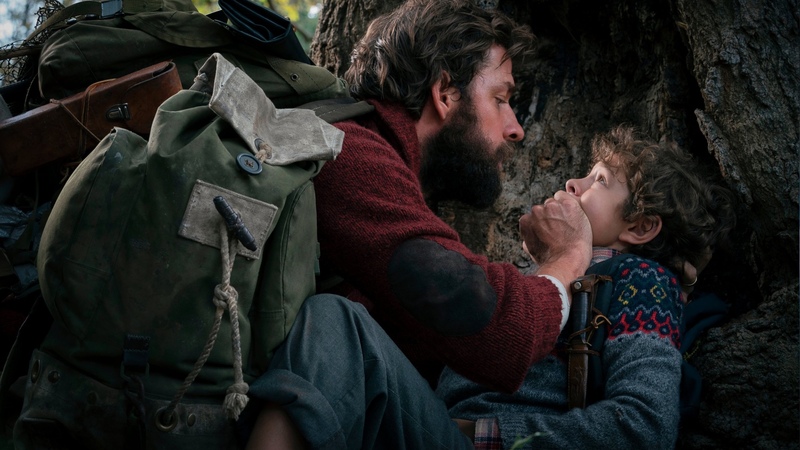 A Quiet Place revolves around the disruption of silence with skillfully constructed showcases of nerve-racking tension and trepidation that utilise the film’s framework without running it into the ground. As certain inevitabilities unfold, plans are executed so that roaring agony is cleverly muffled. Furthermore, when Home Alone-style misfortunes are foreshadowed, it’s still an agonising wait to discover how grim the consequences of unavoidable noise. The film owes a lot of its success to its impressive sound design. Supervising sound editors Ethan Van der Ryn and Erik Aadahl manage to accentuate the most basic of day-to-day noises into deafening alarm bells. We also intermittently hear the world from Regan’s point of view, ranging from a deathly silence to dull white noise when her defective hearing aid is switched on. A disorienting experience that’s amplified when coupled with Marco Beltrami’s foreboding score. The authentic family dynamic created by the film’s cast is also crucial. Real-life married couple Blunt and Krasinski’s chemistry translates well on screen and a moment where the pair sweetly share earphones and a dance offer a fleeting reprieve. Simmonds and Jupe as siblings are also engaging, with Simmonds bringing a level of authenticity as she’s deaf in real life. The talented young actress radiates warmth but equally has an authoritative screen presence when called for. A cross between classic creature features and an on-the-nose take on 2017’s understated horror gem It Comes at Night. A Quiet Place does boast some neat writing by writer-director Krasinski and co-writers Bryan Woods and Scott Beck. However, the film’s dramatic core has been given the Hollywood treatment and lacks the raw edge and staying power of the independent, modern genre benchmarks that apparently inspired Krasinski. 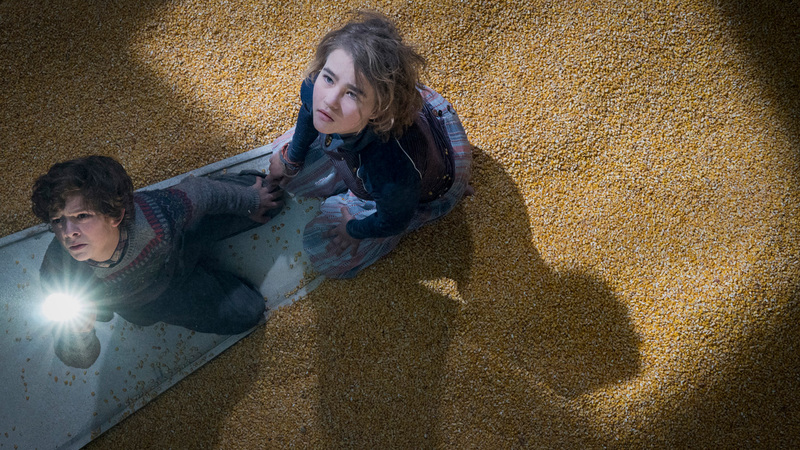 A Quiet Place remains a crowd-pleasing horror with a studio sheen and substance. Not wallowing in mediocrity with the likes of the forgettable The Conjuring franchise which inexplicably became a hit with casual and ardent horror fans. Differing again from other mainstream horror movies that favour a synthetic washed-out look over genuine grit, A Quiet Place has a refreshingly warm colour palette. Director of photography Charlotte Bruus Christensen elegantly captures the glow of the summer season and flourishing lush greenery that contrasts with the vivid red of warning lights illuminating the night sky. The film’s creature is also tactically shot, looming in the shadows with Alien-esque close-ups of Blunt’s shaken, sweat-drenched face. Or frantically framed terrorising a vehicle loaded with terrified kids in the vein of Jurassic Park. A Quiet Place not only truly establishes John Krasinski as a film-maker but is a rare substantial treat within mainstream horror.